Whew! What a weekend that was! 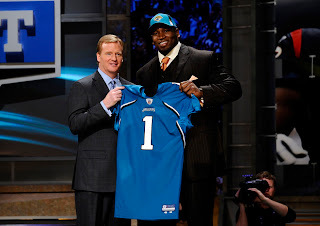 Last Wednesday my wife and I travelled to New York City for the 2009 NFL Draft. This year was a special year for me as my client Eugene Monroe was invited by the NFL to be there. Eugene and his agent Sunny Shah of 320 Sports invited my wife and I up to take it all in. We arrived Wednesday in the afternoon, settled into the hotel then went downstairs to see Eugene, and another one of my clients Josh Vaughn, a RB from Richmond. We met up with them later at a nightclub called TAJ where 320 Sports was having a pre draft party. It was a fun night and a pleasure to meet Eugene, family and friends. Thursday and Friday we poked around NYC taking int he sights which was highlighted by a dinner at TAO. If you have never been to TAO you need to go there at least once, it is awesome. Before I knew it the big day was here, we all met down in the lobby at 11am to get our credentials and tickets for the draft, then went to the westin to have a family and friends lunch with Eugene and all the other invited players put on by the NFL. After lunch we were shuttle to the Radio City Music hall for the draft to begin. The atmosphere at the hall was awesome. There were crazy fans yelling running around with their teams jerseys on. It was cool to see ESPN's Mel Kiper, Todd McShay, Chris Berman, Chris Mortensen along with NFL Network's Mike Mayock, Jon Gruden, and other tv personalities. we found our seats and the draft started. There was not much suspense for the first pick Matthew Stafford, as he had already reached a deal with the Lions. The 2nd pick was St.Louis whom I thought might take Eugene, but they passed and selected Jason Smith of Baylor. Then came the out of the sky picks of Tyson Jackson (Chiefs) and Heyward-Bey(Raiders) which threw a wrench into things. Then the Jets moved up for Mark Sanchez, and finally with the 8th pick Eugene was selected by the Jacksonville Jaguars. When the Commissioner made the selection and said Eugene's name I was very happy, excited and proud. He had worked so hard to make this happen, I was happy he had his family and friends there to share it with. He was speechless, excited and emotional. His journey for now is over. He has a new home in Jacksonville. A new chapter begins this Thursday, when he has mini camp. Knowing Eugene, nothing will change he will still be the hard working, grinding athlete he has always been. Later that night I was at dinner and I got a text that my other OT prospect Sebastian Vollmer was selected in the 2nd round by the New England Patriots. This is another great story as he was born and raised in Germany, and started this season as a Free Agent rated prospect. In my next post I will tell Sebastian's story. Got to run, that's all for now.